NETWORK FINALS: Due to the many NFL preemptions that affected early numbers, we’ll look at the week-to-week comparisons here. ABC: WHAT WOULD YOU DO held at 0.5, and 20/20 lost 0.1 to 0.5. CBS: TKO: TOTAL KNOCK-OUT and WHISTLEBLOWER were steady at 0.5/0.3, and an additional hour of WHISTLEBLOWER was also at 0.3. FOX: BIG3 BASKETBALL returned at 0.3. 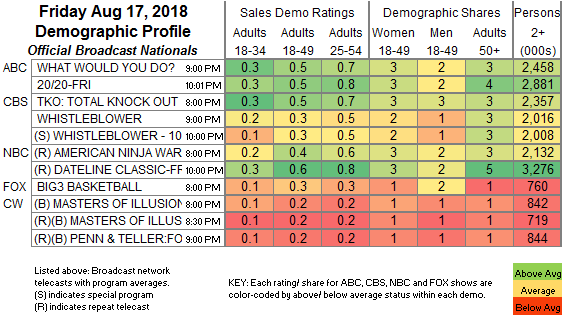 CW: MASTERS OF ILLUSION, along with the reruns that followed, were steady at 0.2 across the board. CABLE HIGHLIGHTS: A&E’s LIVE PD led Friday cable, although down 0.11 to 0.57, with the clip-show lead-in up a tick to 0.30. NFL Network’s Buffalo vs. Cleveland NFL PRESEASON game was at 0.42. 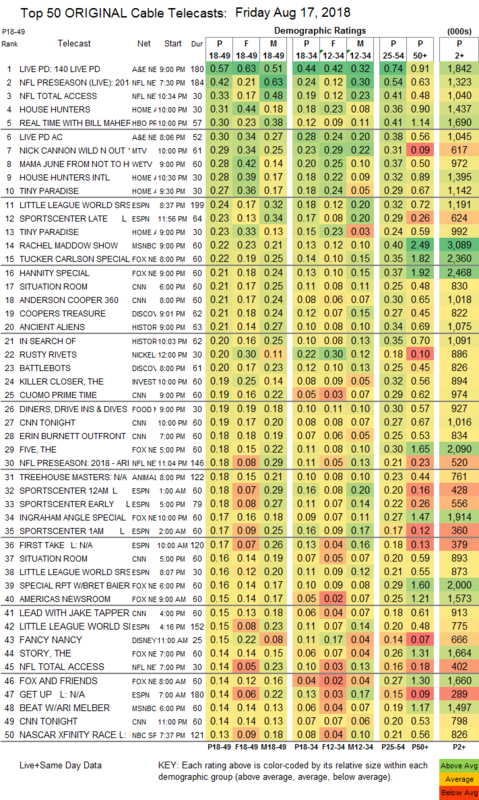 On HGTV, HOUSE HUNTERS held at 0.31, HOUSE HUNTERS INTL was down 0.04 to 0.28, and TINY PARADISE was at 0.27/0.23 compared to last week’s 0.26/0.26. On HBO, REAL TIME WITH BILL MAHER remained at 0.30, with ANIMALS up 0.02 to 0.05, and the newly-renewed RANDOM ACTS OF FLYNESS up 0.02 to 0.04/168K. On TV, WILD N OUT was at 0.29. On We, MAMA JUNE: FROM NOT TO HOT gained 0.02 to 0.28. ESPN’s coverage of the LITTLE LEAGUE WORLD SERIES was at 0.24/0.16. MSNBC’s RACHEL MADDOW SHOW and Fox News’s TUCKER CARLSON tied in the demo, with Maddow at 0.22/0.40/3.1M, and Carlson at 0.22/0.35/2.4M, and with CNN’s SITUATION ROOM right behind at 0.21/0.30/1M. On Discovery, COOPER’S TREASURE rose 0.02 to 0.21, BATTLEBOTS ticked up to 0.20, and MAD DOG MADE was down 0.02 to 0.11. On History, ANCIENT ALIENS fell 0.05 to 0.21, and IN SEARCH OF was steady at 0.20. On ID, KILLER CLOSER lost 0.03 to 0.19. On Syfy, WYNONNA EARP remained at 0.13, and KILLJOYS was up 0.03 to 0.10. Paramount’s BELLATOR LIVE was at 0.10. Cinemax’s OUTCAST gained 0.03 to 0.05.